Nothing spells luxury like a swimming pool or hot tub at home — there’s just something about indulging in a cold swim on a blistering day or taking a dip in a warm pool on a chilly evening. 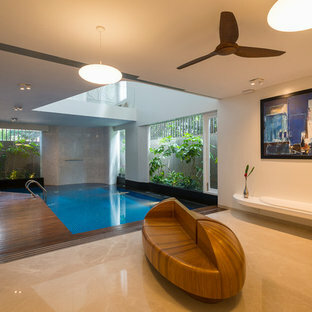 Besides being a nice place to cool off, pools can add visual interest and tremendously increase the value of your home. As you plan your jacuzzi, small plunge pool or outdoor pool in the garden take a dip into these swimming pool images to help you get started. 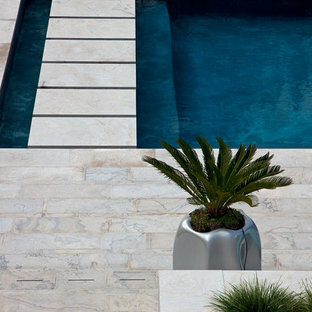 When building or remodelling your pool, start by mapping out the available space. Depending on the location of the space, consider what size, shape and style might work best for your home. If you have a large space in your garden or rooftop, you can explore outdoor swimming pool designs. 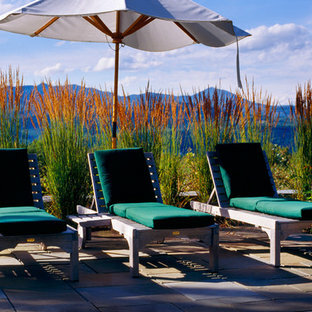 Keep in mind, outdoor pools not only take up a lot of space but can be expensive to install and maintain. If you don’t quite have the space or budget for a large swimming pool design, there are plenty of small pool designs and ideas to work with like a simple plunge pool or a rectangular lap pool for a narrow space. 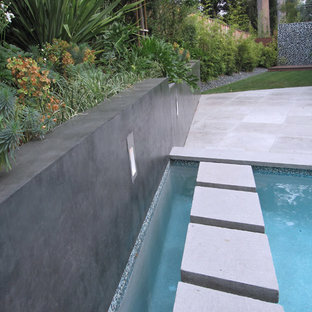 Plunge pools can easily run along a boundary wall or down the side of your house. These options are fairly low maintenance and might do a double duty as a swim spa but remember to take into account the drainage and safety features required. 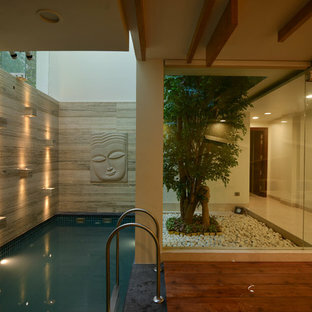 Indoor swimming pools include hot tubs, jacuzzis and above grounds pools. These are relatively easy to plan and install. Most of these units are readily available making them cost effective and moveable. If you opt for one of these be sure to ensure you have proper storage for the unit when it is not in use. What material should I use for my pool or jacuzzi? The quality of your materials can easily dictate the life of your swimming pool. Although vinyl is the cheapest option, it also is the least durable. Concrete and fibreglass are popular, sturdy options, while metal above ground units last longer than plastic ones. Liven up concrete or fibreglass, and the overall appeal of swimming pools, by adding a colourful mosaic tile border or interesting stone to create patterns. 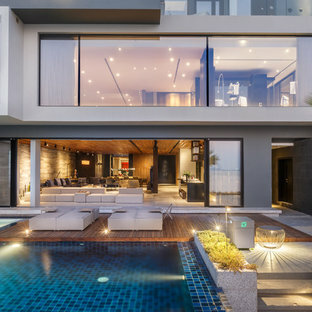 If the swimming pool is in your garden, use a natural-looking material to seamlessly integrate the pool into your landscape, or opt for an infinity edge with a view if you a rooftop pool. What swimming pool accessories can I add? Swimming pools and hot tubs are naturally soothing and fun, but you can still take your pool to the next level with a few add-ons. Install a diving board or slide to make swimming more enjoyable, and add floats and toys, especially if you have kids using the pool. Also don’t forget to add seating and sun protection, like lounges and umbrellas; this will ensure everyone can enjoy the swimming pool, even if they aren’t in it. The InSync Home was produced by Builder and HOME magazines and built in Baldwin Park, Florida as the official show home of 2007 International Builders’ Show. 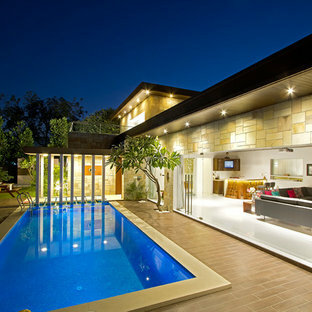 One of the main emphases of InSync Home was to blend indoor and outdoor living. A key area of the home that brings this together is the lanai that opens to the inner courtyard and pool. It was necessary to find a way to merge the two spaces in order to allow the family to enjoy the outdoors without having to suffer from heat or insects. The Executive Screens are integrated into the design of the lanai, retracting into the arches when not in use. The Phantom installation team worked closely with the client to ensure that the screens would blend seamlessly with the overall décor of the home. The InSync design team selected 18/14 insect mesh in charcoal with a sun control factor of 40% and openness of 58%. By using a recessed implementation, the three screens are completely out-of-sight when not needed, uniting the indoor and outdoor spaces in a unique and creative way. This home was built in 1926 and is on the Historic Register. The home was in mild disrepair and the new owner wanted updated utilities and amenities while not sacrificing the historical registration or integrity of the home.